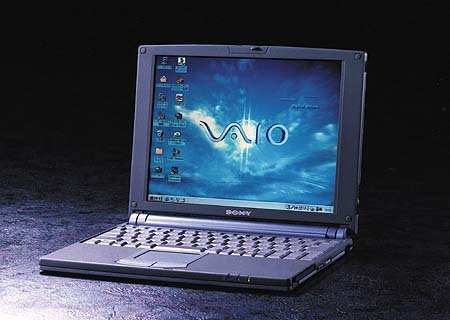 The B5 size notebook computer "VAIO 505" succeeded well in the highly competitive world of computer business scene. At first, B5 size was regarded as the substitute of former products, while, SONY presented this as innovative "portable and high effective" series of which monitor as large as the former but its size incredibly slim. The four alphabets "VAIO" represent "Video Audio Integrated Operation," and the logo mark symbolizes sign wave (V and A) and the digital world (I and O). This series is not only unique for the design but also the possibility of making users image the future of information oriented society.